1. In the Xsheet or Timeline view, select the cell range (or symbol cells) and keyframes to loop. 4. In the top menu, select Edit > Paste Cycle or press [Ctrl] + [/] (Windows/Linux) or [⌘] + [/] (Mac OS X). 5. 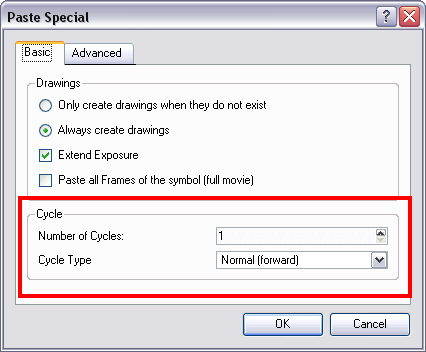 In the Number of Cycles field, use the up or down arrows to increase or decrease the number of cycles you want to paste. You can also type the value directly. ‣ Reverse: Pastes your selection reversed, beginning with the last cell and ending with the first one. 7. Click on the OK button to paste your cycles. Edit > Paste Special or press [Ctrl] + [B] (Windows/Linux) or [⌘] + [B] (Mac OS X). 4. In the top menu, select Edit > Paste Reverse or press [Ctrl] + [.] (Windows/Linux) or [⌘] + [.] (Mac OS X).